Cargo ships carry more than cars and TV’s. They transport aliens, too! Alien species are plants and animals that make their way to a new environment where they don’t belong, and ships are the main source of alien species in the marine environment. Every day, the transport millions of tons of water from one port to another, and that water carries everything from crabs and mussels to microscopic algae and slimy invertebrates. When the ships arrive in port, they offload their cargo and take on tons of water into their ballast tanks to keep them stable. 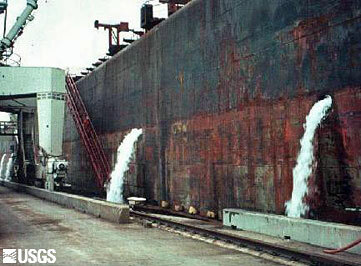 When they arrive at a new port and load more heavy cargo, they don’t need the ballast, so they dump all that water into the new port. Guess what, that’s a free ride for critters making their way from one port to another. WHAT CAN THEY DO? There are some management strategies that shipping companies use to minimize the transport of living organisms in their ballast water. For instance, when they cross oceans, they can exchange their ballast water in the middle of the ocean. This means dumping out the harbor water and replenishing it with seawater. Harbor species and ocean species require different habitats, so we assume that changing water will reduce the chance that any organisms in the water will survive when they are released. The problem is, ships can’t always exchange their ballast water, and critters are sometimes more hardy than we want them to be. Invasive species are a problem all around the world. A species that is carried far from its natural environment may have no natural predators in their new home. That means they have an advantage over the native species. They can outcompete, outwit, and outlast. They survive while the natural ecosystem falls out of balance. Over time, we’ll be posting some examples of the damage invasive species can do.